Why did the mammoth go extinct? Why are there no longer lions in Europe? Why is the largest predator in Australia a smallish dog? There is a clear and concise explanation for every last one of these extinctions, backed up by a great deal of evidence: In North America, the mammoths and lions disappeared within centuries of humans first arriving, in Europe they lasted until warming temperatures improved conditions for people, and on their last island refugees, such as Wrangel island off the coast of Siberia, they lasted until just 4000 years ago, when finally, people arrived there too. A similar story is seen in Australia. When humans first arrived 50,000 years ago, the native megafauna of the continent immediately collapsed, leaving only a few medium sized marsupials, such as the thylacine, as the biggest predators on the continent. Later, a new wave of people arrived, this time bringing more advanced weapons and, crucially, dogs, resulting in the extinction of all thylacine populations save the one on Tasmania, where dingos the never reached. The evidence for this scenario is clear and conclusive, backed up by multiple studies and seen across the world. The unique birds of New Zealand were doing just fine until 800 years ago, when the first Maori arrived and promptly proceeded to wipe nearly all of the flightless and many of the flighted species out. When the Europeans arrived several centuries later, they merely finished the job. The megafauna of South America, once the most biodiverse in the world, died out within centuries of humans arriving, after having endured millions of years of ecological and climatic upheavals with little to no effect. The giant lemurs and fossas of Madagascar were eradicated shortly after the arrival of the first humans 3000 years ago, and the few and tiny populations of elephant birds that had managed to cling on disappeared once again after the coming of the Europeans. Arguably most famous of all recent extinctions is that of the dodo, though what fewer people know is that the dodo shared its island home of Mauritius with a wide variety of odd and endemic species, including giant turtles and multiple other species of flightless birds, all of which were wiped out shortly after people came. This does not seem like a complicated issue - quite the opposite in fact. Every time humans arrive on a new landmass, the result has been an immediate wave of extinctions. This is seen across the whole world, and evidence for it is ample. Surely, nobody would be naive or stubborn enough to contest this, right? As we will soon see, the bounds of human incredulity and denial are truly limitless. 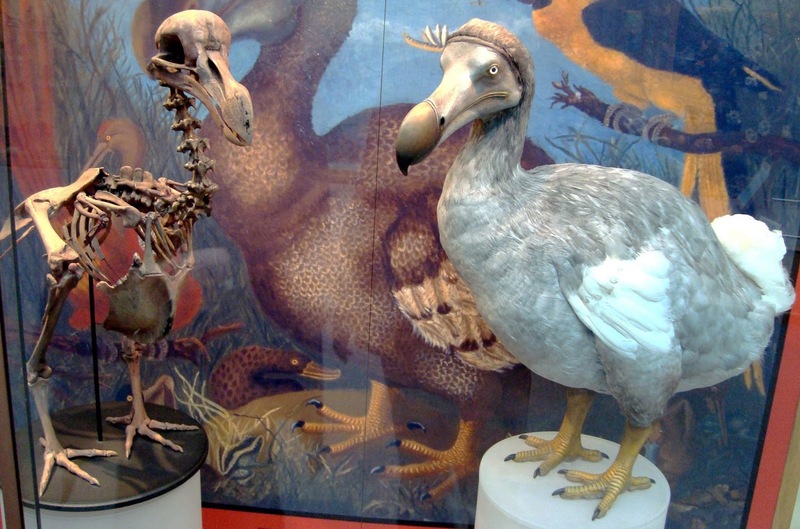 Raphus cucullatus, the famous dodo. Once abundant across its habitat, it is now, as the saying goes, "dead as a dodo"
Tarpan. Isn't it an evocative word? It brings to mind images of wild horses, untamed by man, of fierce stallions and galloping herds. When it comes to wild horses in Europe, "Tarpan" is the go to term. Unfortunately, it is also one shrouded in controversy, and for one simple reason: nobody really knows what it means. It seems simple enough - the Tarpan is another word for the European wild horse, right? Well... kinda. Sometimes. It is certainly true that the undomesticated horses which roamed Europe in prehistory are commonly referred to as Tarpans, but the problem is that the designation is not exclusively limited to them - nor necessarily should it be. If Tarpan is a word for the European wild horse, then it should apply to all members of that species, regardless of when they lived. The factor that complicates everything and throws this neat and tidy definition out of the window can be summarized neatly in one word: Interbreeding. Europe has been home to domestic horses for a long time, and for the entirety of their time coexisting with their wild relatives, interbreeding has most likely occurred. Now, at first this was not an issue, since the populations of (mostly) pure wild horses were so larger that the genes of a few domestics did not have much of an impact. As time went on however, and the wild horse populations plummeted, this genetic balance was lost. Suddenly there were significantly more domestic horses than wild ones, and in times of war or simply due to accidents, domestics were often abandoned and left to their own devices, resulting in them becoming feral. This is where the boundary between wild horses and domestics becomes incredibly blurred, and where the word Tarpan really starts to grow sketchy. Historical observers from centuries passed were rarely detail-orientated enough to take note of the subtle morphological distinctions that separated wild horses and domestics, so whenever a herd of wild-living horses was spotted, these animals were simply referred to as wild, and sometimes, you guessed it, "Tarpans". This makes it very difficult to ascertain whether any given historical account of wild horses living in an area actually refer to true, undomesticated horses, or simply feral descendants of domestics. To make matters even more complicated, as mentioned before, extensive interbreeding took place, and in the latter years of the wild horse's existence, it is plausible if not almost certain that very nearly all populations of so-called Tarpans were either hybrids or pure domestic animals, with very few pure wild types remaining. This is often referred to as the only known picture of a Tarpan, but looking at its morphology, the animal shown is almost certainly either a hybrid or a pure domestic, as it bares very little resemblance to neither the skeletons we have of European wild horses, nor the extant and closely related Przewalski's horses. To add one final layer of complexity and doubt to the word "Tarpan", today it is often used to refer to certain "primitive" breeds of domestic horses, particularly the Konik Polski. 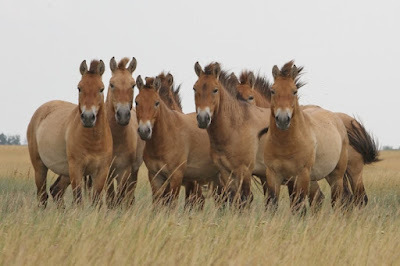 Koniks are one of several breeds often claimed to be either direct descendants of wild horses, or, in the Konik's case, a deliberate back-breeding attempt that incorporated hybrids of wild and domestic animals, thus resulting in a breed almost identical to the original wild horse. While the Konik is undeniably a sturdy and "wild"-looking breed, its morphology, like that of the animal in the picture claimed to be a Tarpan, and all other modern horse breeds, does not match that of the wild horse. Genetic tests have shown that it is no more closely related to wild horses than any other modern breed, and the story of it being a back-breeding attempt has been demonstrated to be a myth. In reality, the Konik is simply a particularly hardy breed originally used as draft animals in their native Poland, where the breed presumably originated, which just so happens to somewhat resemble the original wild horse. And yet, regardless of everything I just told you, the Konik is still often referred to as a Tarpan, including by organizations such as Rewilding Europe. Pictured: Not Tarpans, but instead a herd of Przewalski's horses, the world's only still extant species of wild horse. 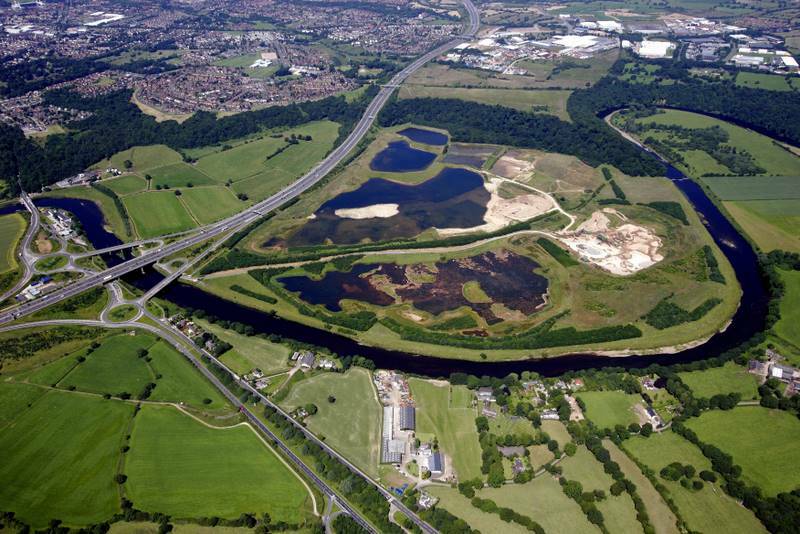 We - or most of us at least - live in cultivated, domestic landscapes. The places in which we live are molded and shaped by human action, and what wildness does exist persists where we have allowed it - or failed to notice it. It is upon this backdrop of suburbs and cities, of supermarkets and cornfields, that most conservation must take place. This is not necessarily a good thing, but it is an undeniable fact of reality. Even in the most distant corners of most countries, anthropogenic influences are still ever-present, and there are people trying to make a living. There are spots, some larger and some smaller, where people are mostly absent, but rarely wholly. In the Scottish highlands, shepherds make their living, in the north of Scandinavia, Sami herd reindeer, and in the Balkan mountains, hunters and farmers base their livelihoods off the land. Here in Denmark, while we have several areas of relatively wild and connected landscapes - significantly more than most people realize - these are still generally used by at least some people. Most of our forests are logged, either by the state or private landowners, our meadows are grazed by livestock and bordered by intensively managed agriculture, and even our biggest and wildest places, such as the hinterlands of the Jutlandic west coast, are often used by the military as training areas. Sometimes these human activities are mostly unrelated to and unaffected by whatever conservation may be taking place. Sometimes the human activities may be directly dependent on them, but in most cases this does not hold true, and in all cases, the presence of people must be taken into account. 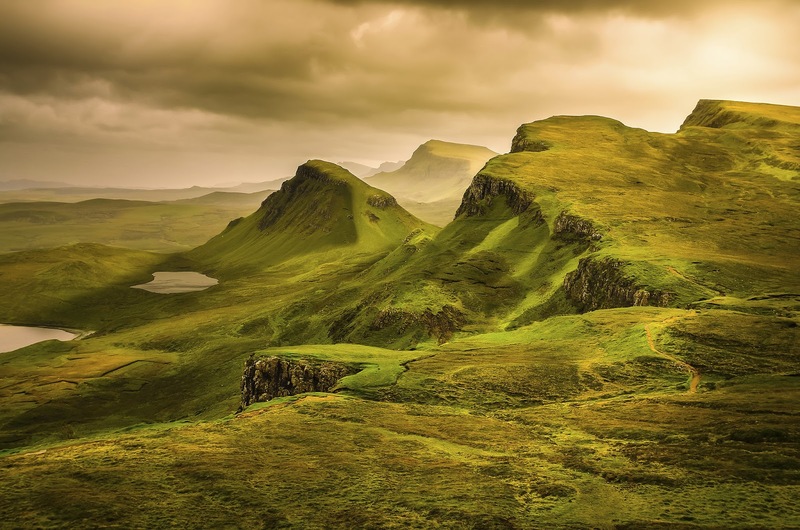 I write about this in part because I have recently been reading and listening to a wide variety of perspectives on conservation and nature, and in part due to the influence that a book by the name of Landmarks, written by Robert Macfarlane, has had on me. The book I will return to later, but for now I will focus on these differing perspectives. It is awfully easy to surround yourself in an echo chamber, an environment in which only agreeing opinions are heard, and in which arrogance and negligence often blossoms. I am, as readers of this blog will probably know, a big advocate of rewilding, and the radical forms of it at that. I follow the movement attentively, and generally have much less interest in traditional conservation, as I see it, to put it bluntly, as a failed attempt, in many cases not worth continuing. This is not of course a commonly held opinion, and even rewilding as a whole is still a relatively niche part of conservation, albeit one which is rapidly expanding. When reading about subjects such as rewilding, about reintroductions and habitat restoration, it is easy only to see the sources you agree with, and become distant to all dissenting voices. It is not that you do not know that they're there, that you don't realize there are people who disagree - of course you do, they're the obstacle that must be overcome for conservation to take place. And that's just it. These dissenting voices, these people who disagree, or at the very least take issue with some parts of conservation and rewilding, they are quickly reduced from real, flesh and blood individuals, with their own motives, worries and passions, to nothing but "obstacles", problems that must be overcome for real, true progress to be achieved. I am not from Australia, so I have no doubts that whatever I say will be dismissed by at least some people as just the ramblings of an uninformed foreigner. They may be right, but I would like to think that at least some subjects can be mostly, though not entirely, learned from reading and thinking. I have written about Australia before, and in fact I have something of a fascination with the continent for a variety of reasons. One is the most obvious; from a wildlife perspective, Australia is unlike any other continent on present day Earth. The marsupial faunas that (used to) dominate there are the last remaining on the planet, after South America's collision with North America essentially ended the age of marsupials there, and the general cooling of the global climate wiped them out on most continents. In this respect, it offers us something of a look back at earlier times, and gives us a window into the past diversity that marsupials once enjoyed across so much of the world. There is another reason for my fascination with Australia however. It is the only tropical first world country, and certainly the least densely populated one. 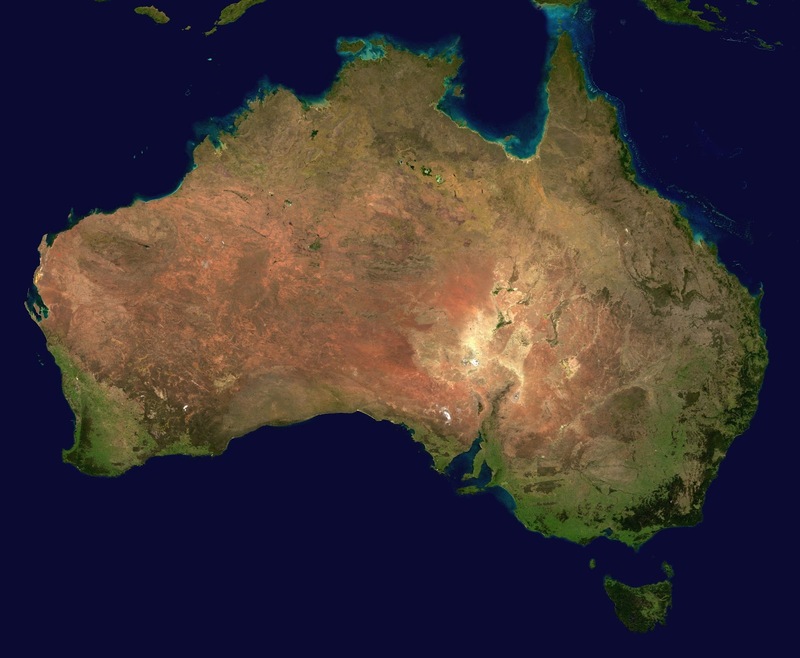 The great majority of Australia is still wilderness in one form or another. A rich country with magnitudes of uncultivated wilderness and an iconic endemic fauna, that sounds like a great thing, doesn't it? Most of the problems facing wildlife in other tropical countries are at least partly a result of the widespread poverty and corruption in said countries, and while Australia cannot necessarily be completely cleared of the later, it is certainly nowhere near as extreme as in most countries with similar climatic conditions and quantities of wilderness. You would think that the Land Down Under would be an ideal place for nature, a country with a great fauna wealthy enough to protect it. So why is everything going so horribly? With 11% of its mammalian fauna extinct within just the last few centuries, it has the highest rate of mammal extinctions in the world. On top of that, 15% of the remaining species are also endangered, with more yet more on the verge of being so. All in all, things are not going well for Australia's mammals. The typical explanation for this is that, as an isolated island continent, Australia's endemics are especially vulnerable to introduced species. It was the foxes, goats, and horses that did it, or so the story goes. In this post I will be arguing against that prevailing idea, and continuing on my previous post on Australia in arguing that invasive species are merely a symptom of a wider problem, and that a few of the introductions may in fact be part of the solution. Australia: Land of marsupials, especially extinct ones. We don't like change. That is understandable, from an evolutionary perspective whatever situation we are currently in is obviously one that is keeping us alive, and as a result, any potential deviation could be dangerous. If our environment at present is adequately supplying us with food, water, and all our other basic needs, any changes, even those that could be positive, are still bringing risk where there previously was none. An old saying is "if it ain't broke, don't fix it", and that particular mentality may be more deeply ingrained in us than we tend to realize. However, as with so many other parts of our biology, our way of life has changed so radically in such a short span of time that evolution has not yet had time to catch up, and this "now good, change bad" mentality seems to be a leftover from our hunter-gatherer past, and a dangerous one at that. We no longer live in the relatively stable environment we evolved in - change is constant in the modern world, and so attempting to ensure that present conditions prevail is inevitably futile. On top of this, mirroring the changes we have dealt to our own lifestyles, the influences and alterations we have induced upon the natural world within just a few thousand years are vast, so vast in fact that we almost certainly have yet to even fully grasp the consequences of what we have done. The main reason for this is that nature is slow to react - or rather, we are incredibly quick to act. Typically in nature, even if changes in the environment send a species spiraling towards extinction, it can still take thousands if not millions of years before the last individuals die. Likewise, changes in climate almost always cause drastic shifts in faunal and floral communities, but these shifts are not instantaneous. Plants are long-lived and slow to disperse, and so it is not unusual to find communities of plants growing in places where others could grow as well if not better. What I am trying to get at by saying all this is that even though many of our impacts on the environment are already obvious, their repercussions may take hundreds if not thousands of years to fully manifest. In some cases we can already predict future changes even though they have not yet occurred. An example of this would be several of the species of birds living in our farmlands throughout Europe. Today we associate them with this intensively managed landscape, but comparing present populations to past ones, a downward trend quickly becomes obvious. The populations living in farmlands today are not so much adapted to that habitat as they are relics of a time when different conditions prevailed, mainly the ages before intensive agriculture and pesticides. In time, they will die out, unless another change occurs. The significance of this should be obvious, as it means that we need to be very careful when determining what is in fact any given species' ideal habitat. In Denmark the Goldcrest may almost exclusively live in plantations of non-native conifers, yes, but this is probably a result of the destruction of all native pine forests, not an actual preference for conifer plantations, an environment that does not occur naturally, and thus could never be the ancestral habitat of the Goldcrest anyway. In summary, the present is not nearly as stable as many of us seem to think it is, and any attempts to preserve current conditions on a large scale are inevitably doomed to fail. As we will soon see however, this is not necessarily a bad thing. Much ink has been spilled over the merits and flaws of rewilding. It is a concept which I have come out in support of multiple times before, though I take issue with many of the claims and arguments made by some so-called "rewilders". One of the main points of disagreement between advocates and opponents of rewilding has been as to what impacts simply letting nature reassert itself would have. Some people say that it would be negative, that human activities are necessary for the preservation of our ecosystems, while others say that it is unquestionably a positive, that can only serve to better our wildlife. Both of these positions are of course extremes, and most people lie somewhere in between, but they give a general idea of what the sides are. To actually answer the question is a difficult if not impossible task, as it would depend on a wide variety of factors. Whether reintroductions are considered a necessary part of rewilding, for instance, completely changes what results said process would have. In this post, I will indulge in a thought experiment of sorts, centered on the British highlands: What if all farming along with most other human activity everywhere in the uplands was stopped, and deer numbers were heavily culled and kept at bay. No reintroductions, no direct action aside from the culling, just a complete ceasing of all activities in the highlands. I do not actually advocate this scenario, nor do I find it remotely plausible, but it offers some idea of what the outcome of one extreme form of rewilding would be. As we will eventually see, it also shows why reintroductions are in fact necessary for rewilding and habitat restoration in the long term, and that "grazing bad, trees good" is not always true. Elephants, members of the group proboscidea, are beloved by everyone; they are big, charismatic, and essential keystone species throughout their native range, even in the places where they are now extinct. Once one of the most widely distributed groups of large herbivorous mammals on the planet, they are now confined to tropical Asia and Africa, and even then just barely in many places. I have mentioned them before when talking about some of the regions which they once inhabited, but never in great detail. That changes now, and in this post I hope to cover pretty much the entire native range of proboscideans on all continents, focusing mostly on those now extinct. Just to clarify briefly what I mean when I say "native", while the term has no true agreed upon meaning, for the sake of this post I will define it as any animal which is currently or would still have been present in an area, if not for human activity. Another fact that must be mentioned is that the terms "proboscidean" and "elephant" do not mean the same. 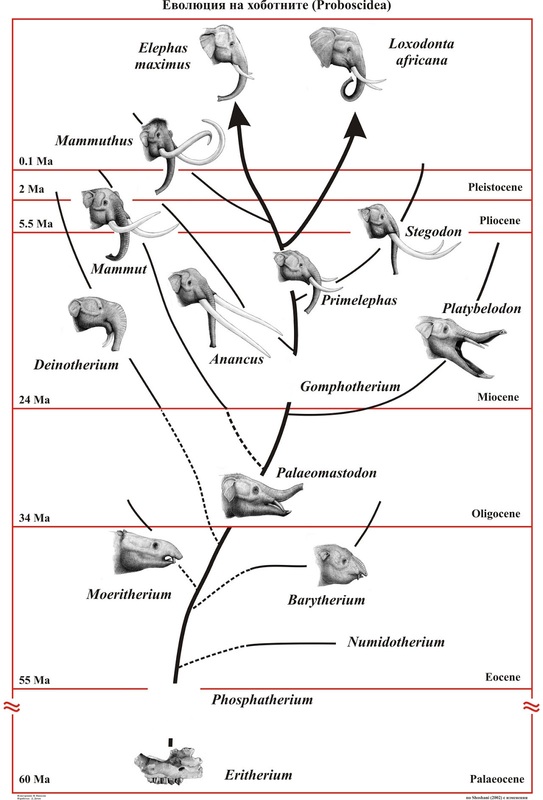 All elephants are proboscideans, but not all proboscideans are elephants. 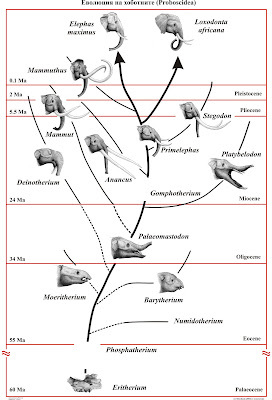 The proboscidean family tree is typically divided into two main groups, the elephants and the mastodons, which split early on in their history. So, with that settled, let us begin with the two places where elephants are still present.